Celiac disease is an autoimmune disease which now common. People with this disease cannot eat the protein called gluten because it harms their small intestine. One person out of 100 in the world is unaware that they have it. 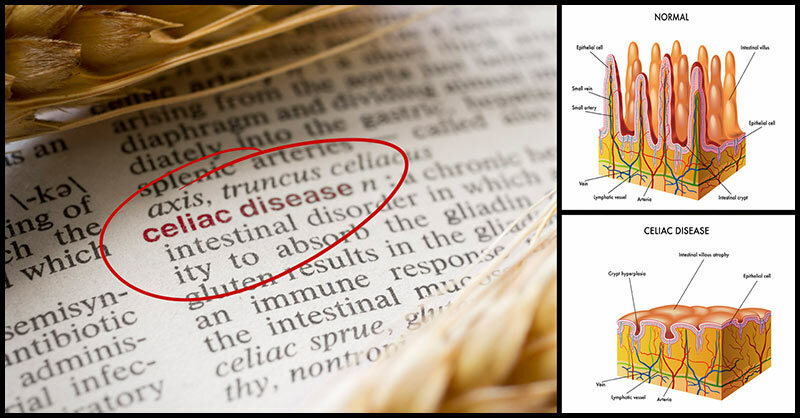 Usually, symptoms of celiac disease are related to the gut which includes stomach pains, constipation, diarrhea, and nausea. These are often experienced by people with the condition. Yet, they are often misdiagnosed as irritable bowel syndrome (IBS). Research shows that 11% of the global population has IBS, however this diagnosis cause people with celiac disease to live untreated. Feeling tired is one of the most commonly ignored symptoms of celiac disease. It is often mistaken as a common and everyday feeling. Extreme tiredness may be a side effect of the other symptoms like when the body is not getting adequate nutrients because of the reaction it is having to gluten. One of the common symptoms of autoimmune conditions, such as celiac disease, is mouth ulcer because they indicate a generally rundown system. For those people with celiac, mouth ulcers are large and sore which causes a particularly damaging impact as the whole mouth is affected. Anemia occurs when the body does not absorb enough iron. When the body does not absorb enough iron, anemia can occur. Even though not everyone with anemia will have celiac disease, it can often be an indicator of deficiencies in B vitamins. 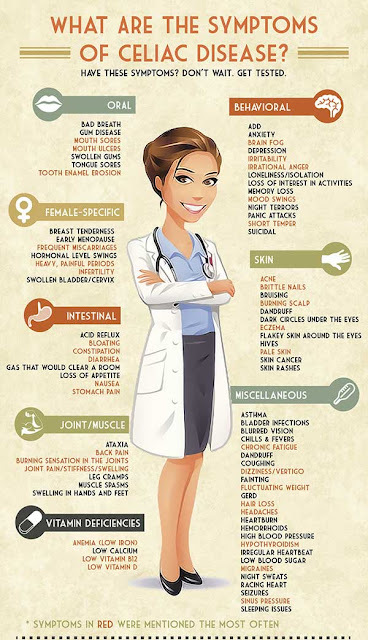 People with celiac disease usually have nutritional deficiencies because the condition damages the lining of the gut, which in turn cause malabsorption of the nutrients and vitamins from the food you eat. Dermatitis herpetiformis (DH), which is a skin rash, is linked to celiac disease. It is an autoimmune problem that causes small itchy and stinging blisters which develop anywhere but commonly occur on the elbows and knees. Osteoporosis, a condition makes the bones weak and fragile. Depression is another sign of celiac disease. Yet, the exact relation between celiac disease and depression is still unknown. Ataxia is defined as a group of disorders that affect speech, coordination, and balance, which can lead to problems with balance, walking, speaking, swallowing, and vision. Sudden weight loss can be a result of a weakened immune system and malabsorption of nutrients in the gut due to celiac disease. According to some studies, undiagnosed, untreated celiac disease is linked with infertility problems. Tooth loss is a rare symptom of celiac disease. An undiagnosed celiac disease can cause tooth damage due to a grooving of the enamel and a sort of discoloration. People with undiagnosed celiac disease experience patchy hair loss. Even if it is not a typical symptom like gut problems, it is something that you should be aware of. You can treat celiac disease by eliminating gluten from your diet. Luckily, naturally gluten-free food groups are available for you to include in your diet and these include legumes, nuts, beans, fruits, vegetables, meat, and poultry.